1. Always make double or triple so you can freeze all that you don’t need right away. It’s a bit of work but future you thanks you so much, no seriously, future you that is so tired one day, even picking up a slice of pizza feels too much a burden remembers that you stashed these in the freezer and is so verklempt with gratitude, it’s writing your name across the sky right now. 2. We are going to one-pan sheet pan just about everything, thank you The Kitchn for this brilliant idea. In the oven, you can roast everything you need; I even used it to wilt/crisp the greens, and warm the beans, and then mix all the toppings together to scoop into the tortillas. I suspect if you were enterprising enough, you could also make pockets to bake the eggs in but soft-scrambled them on the stove and didn’t even mind because everything else had gone so swimmingly. 3. There is no recipe on earth that will work for everyone. I am not listing the potential things one could stuff inside a burrito, breakfast or other, because if we had time to read such drivel, we wouldn’t be eating food one-handed. Below is the way I like mine. Maybe you need avocado in yours — that’s fine, but I do not love the texture once frozen and defrosted — or roasted or rehydrated chilis or hate potatoes; the beauty of making your own, be it breakfast burritos or whatever else you don’t have enough of in your life, is that you get exactly what you want, exactly the way you want it. Prepare vegetables: Heat oven to 400 degrees. Coat your largest baking sheet thinly with oil. 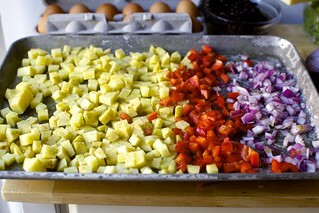 Arrange your components — potatoes, pepper(s), onion, sausage or strips of bacon — in different parts stripes down the pan. (This allows you to rescue some items sooner if they cook faster.) 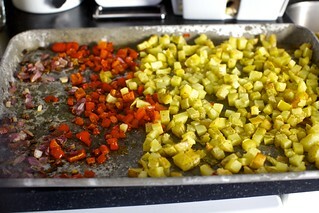 Coat with another glug of oil, and season the potatoes and peppers well with salt and freshly ground black pepper. Roast for 30 minutes. The bacon and sausage should be cooked through and crisp at this point; you can remove them and set them aside. Use a thin, large spatula to lift and turn the potatoes and peppers; return them to the oven for another 5 to 10 minutes, or until potatoes are tender. 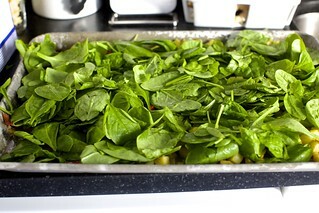 When potatoes are tender, scatter spinach on top, return to oven for 5 minutes; it will wilt quickly. Use your spatula to mix all of your roasted ingredients together. Scatter black beans over (this will warm them), crumble or chop bacon, if using, and return it or the sausage to the tray so everything’s in one place. Prepare eggs: Whisk your eggs together in a large bowl until lightly beaten. Season well with salt (I use 1/2 to 1 teaspoon kosher) and many grinds of black pepper. Heat your largest frying pan over medium-high heat. Once it’s hot, add a bit of oil to the pan and heat it too. Once the oil is hot, add your eggs. Let them cook for 20 to 30 seconds before beginning to move and turn them in spatula-wide sections. When eggs are mostly cooked but still a tiny bit runny, scrape them into a bowl. 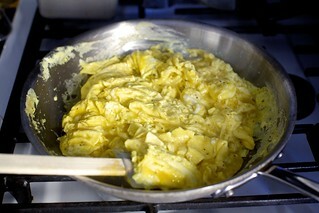 The residual heat of the eggs should cook them to about the 95% mark; they’ll finish cooking as you warm your burritos. 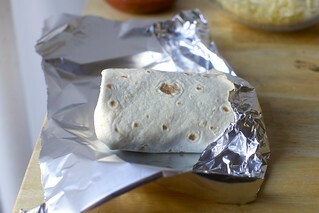 Assemble burritos: Place a large square of foil on your counter. Place first tortillla over it. [I find mine are soft enough to wrap without tearing from the bag, but if yours are not, lay it on a pan in the probably still residually warm oven for a minute or two to soften (but not dry out).] Eyeball about 1/8 of the vegetable mixture and scoop it into the center, followed by a little salsa (I use 1 to 2 tablespoons per burrito), 1/8 the eggs, cheese to taste, plus whatever fixings you cannot live without. 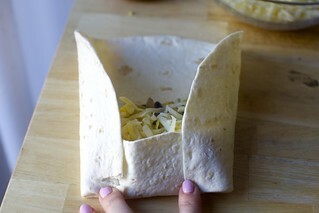 Roll the burrito tightly by folding the sides over the filling then rolling from the bottom up. Wrap in foil the same way; folding the foil first over the ends of the burrito (ideally forming a “cup” at each end to catch drips, although my kids just see this as a challenge). 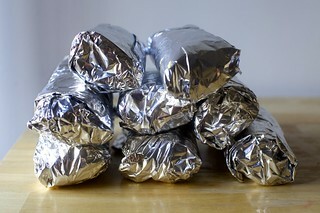 To freeze: Place foil-wrapped burritos in a freezer bag and press all of the air out. They will keep in the freezer for 2 months. To warm from the freezer in the oven: I place the foil-wrapped burritos on a tray in a 350-degree oven for 30 to 40 minutes (turn over halfway) to heat them through. Depending on how cold your freezer is and how packed the burritos are, it could take more or less time. To check, press a toothpick through the foil into the center of a burrito and pull it out; if the toothpick feels warm or hot, the burrito is heated. If it’s cold (it will be clear if it’s cold), it needs more time. To warm from the freezer in a microwave: Remove foil and microwave for 2 1/2 to 2 3/4 minutes, turning burrito over halfway. I find microwaves range a bit in defrosting times so you might find you need more or less. To defrost in the fridge and warm in the oven: If you’re a plan-ahead type, you can let it begin defrosting in the fridge overnight. I heat these the same way I do frozen ones, but check 10 minutes sooner. I highly recommend not leaving burritos in flour tortillas in the fridge for more than a day; the wetness of the fillings can make the wrappers mushy or soggy. This sounds soooo good, I feel like making it even though I am not a particularly big burrito-fan…. My significant other will be super-happy. Thanks Deb. I’ve been eating freezer breakfast burritos for YEARS and would not make it through the morning without them. The key is exactly what you say, make them with the things that you like and find a streamlined way to do it. I’m so excited about this strategy, Deb! This could be a game changer in my household. Many thanks! Every time I make breakfast burritos, I find that the eggs weep and the whole thing turns into a drippy sad mess. Yet when I BUY a breakfast burrito, that doesn’t happen. What am I doing wrong? Have you had any experience with this? Anyone have a magic cure? I read in a recipe once (for sheet pan scrambled eggs) that eggs weep when they’re over cooked. Maybe Deb’s tip to just undercook a bit is the key. “Undercooking” should help, as well as moving the eggs around a lot in the pan. I’d also recommend salting your eggs 10-15 minutes before you cook them. I swear by J Kenji Lopez/the Food Lab’s scrambling techniques and I’ve never gone back to another way since. I always have burritos in the freezer for quick meals. The one thing I’ve found helpful is to dump all the prepped ingredients into a big bowl and mix before dividing it into the tortillas. That ensures a more even distribution of everything and helps prevent bites that consist of all beans, cheese, etc. However, I don’t like eggs in burritos so I don’t know if they would handle being mixed as well. That’s exactly how I make mine, and so long as I soft scramble the eggs separately from the veggies/meat, then I can mix them into a bowl and portion them out so each tortilla has just the right amount of filling. I make these all the time for my hubby, and my trick is to have at least the sausage or bacon cooked the day prior (I plan for it and make a ton). 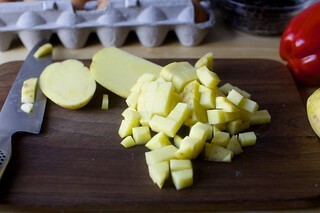 Then it’s just prepping and cooking the veggies and then the eggs, which makes it seem easier. Sometimes I make the tortillas while I’m waiting for the veggies to cook, but more often than not, they are store bought. I haven’t even read this yet but I am SO EXCITED you posted a recipe for these! I have been hoping you would. I know there’s plenty out there, but you always anticipate and explain little glitches, etc., and so I’m looking forward to trying this out some time next week! Thanks! Love breakfast burritos but for simplicity’s sake I am team breakfast taco: fresh corn tortillas, scrambled eggs, and good cheese. Done. That’s how my husband does it! Gluten free tortillas don’t really hold up to being rolled, so he started doing it out of breakfast-for-dinner necessity. Deb: thanks for the cooking inspiration. I love having ready-to-eat homemade food in the freezer, and these will be delicious. Instead of saying I really should make this I really did. Terrific. Easy. An 8 oz package of Morning Star Farms vegetarian sausage worked just fine. I use their sausage too! I’m not vegetarian or vegan, I just really like their sausage. It works really well in stuff like this. Deb, that toothpick-hack for finding out if the frozen burritos are reheated is genius! As is roasting everything on a sheet pan. Thanks for sharing! Ditto…verklempt! That’s a term that takes me back! I’m not embarrassed that I have three different tabs open right now with Smitten Kitchen recipes going on! I got all of the ingredients for this recipe in my CSA share this week but the tortillas and cheese. It was the perfect post to find this morning in my feed. Thanks Deb. You never fail me! Thank you for the great idea. Will use scrambled tofu instead of eggs. It freezes fine. Really, thank you. Wholesome and healthy. Love it. Brilliant!!! 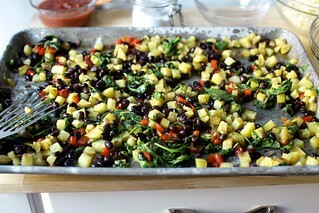 Different stripes of food on a sheet pan = genius. Definitely doing this. Future Me does love to dive into the freezer for burritos when I’m trying to get us out the door, pronto, usually to the airport or similar, with a lasting breakfast. But yes, they’re tons of work. One tip I learned from somewhere — maybe Marc from No Recipes? — is to warm the burritos from the frozen state in the microwave but then finish them in a dry, hot skillet. This way the raw tortillas not only cook but also brown and crisp up. Game changer, here. That means I wrap burritos in waxed paper first, then foil, but remove the foil for the microwave and then the waxed paper for the skillet. Great tip! The microwave really goes right to the center of things so it seems perfect here. If you where in Texas and had a Breakfast Burrito, and the person or restaurant that sold you your item called it a breakfast burrito. Well they should be kicked out of Texas or slapped in the head. They are called breakfast tacos not burritos! … breakfast tacos and breakfast burritos aren’t the same thing. Just like how tacos and burritos aren’t the same thing. Yes but in Texas we don’t eat breakfast burritos! That’s what he was trying to say. Or we don’t in Austin at least, can’t speak for the rest of the state. Breakfast burritos are a good indication of out of towners. Even the massive, definitely overloaded even if they were making 3 tacos instead of 1 Don Juan from Juan in a Million is listed as a taco. I would love to know what brand of flour tortillas you recommend? I definitely don’t have a favorite. I think these were Mission? Which are, you know, not very special and full of unnatural ingredients. But they do the job. Have you tried Tortilla Land? Their corn are a bit soapy but the flour are on point. They take a tiny bit of extra work bu SO worth it! Will definitely make this. But why just for breakfast? I’m thinking this would be a great dinner! Try this instead: Spread mashed avocado or guacamole on crisp tostada shells you’ve heated briefly in a microwave. 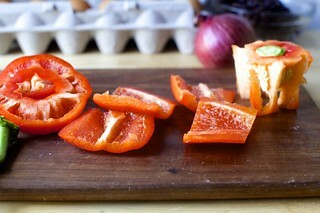 Top each with a poached, fried or scrambled egg; a little shredded cheddar; and red or green (preferably) salsa. Fast and easy (although not portable), and so good you’ll wonder what you saw in burritos! Another lovely post that is as much SK food-prep-strategy-with-endless-possibilities (my veg will scream for cumin, chili powder, and oregano) as it is SK recipe. Thank you, Deb. I’m thinking, though, that using a pen thermometer and baking/reheating to a given temp rather than using a toothpick to assess reheating could yield more consistent warmer-upper results. Deb, might you have an internal burrito temp in mind? Or, has anybody tried this? If so, please share your results! I am definitely getting these in my freezer! The sheet pan roasting tips make this so much easier. I made these with Trader Joe’s Soyrizo and they are fantastic! Breakfast tacos can’t be frozen successfully, or even refrigerated and reheated. But the beauty of them is that you DON’T make them yourself. You stumble out of bed, and on your way to work or whatever you have planned for the day, you stop at Taco Xpress, or Torchy’s, or Taco Shack, or Mi Madres, and 10 minutes later, you walk out with coffee and your hot, tasty, made-to-order, and vegetable-free tacos on freshly-made tortillas. It’s like stopping at McDonald’s for an Egg McMuffin, except, you know, GOOD. Breakfast tacos are not, in any way, a traditional Mexican dish. Most likely they were first served in Austin or possibly San Antonio in the 1970s. So I am not claiming that you can’t put anything you want into a taco (or burrito). And, putting aside the horrifying reality of packaged tortillas, I’m sure that these burritos are delicious. But they are not anything like what you’d be eating for breakfast in Austin! We Texans have to stick together, or before you know it, some Yankee will recommend putting BBQ sauce on your smoked brisket from Franklin’s! Thank you for saying everything I was going to say! Thank you. I love this. (I have a few friends from Texas and they usually straighten me out.) The burrito + Topo Chico combination is one I got at El Primo last November when I was in Austin for book tour. (The breakfast taco and burrito menu is right on the truck, of course.) Maybe I went to the wrong place! Hah! Well, TBH, El Primo makes some pretty good tacos–breakfast and otherwise. It’s just that Texans get a little cranky when someone confuses our favorite foods with something from California! I’m from Austin and I never had a breakfast burrito until I moved to Chicago! My favorite breakfast taco is bean and cheese or potato and egg, so not hard to make at home necessarily but it’s the salsa and the tortilla that makes or breaks it so you will never beat the taco from your corner place with fresh salsa and freshly made tortillas. These do look good though. I wish someone would make me a freezer full of them. This comment made me laugh out loud. I’m also an Austinite, love Smitten Kitchen & had all the same thoughts while reading this. Thanks for the laugh! Another Austinite here. I scrolled all the way through just to see if someone commented on this! Not to worry, Texans are quick to correct but fast to forgive. I’m from California and can say that yes, the breakfast burrito is from California. Don’t quote me on this but I think they started in the old roach coaches or “food trucks” that fed construction workers and early morning laborers. Personally I think you are making them too complicated. Spinach? That’s kinda fancy. You fry the potatoes in a pan, when they are done put set them aside. In the same pan (without potatoes) put in onions, peppers (if you want, I would skip them) or just drop a dollop of salsa, then crack an egg or two and scramble in the pan. When that’s done set that aside with the potatoes. Heat up your flour tortillas in the same pan until they are soft, stuff them with eggs and potatoes, then put them back on the pan so the outside gets crunchy. You get the hang of this and it shouldn’t take you more than 10-15 minutes. Enjoy! I don’t think I’ve commented in the ten years I’ve been reading this blog, but I htae signed in just to say that hot, wet lettuce is terrifying and I thought I was alone in the world for thinking so. Thank you. Made these today, my future self will be grateful. I found using my blender to whisk a dozen eggs made them very fluffy. I opted for butter (1 tbsp) for the eggs and spray for the veggies. 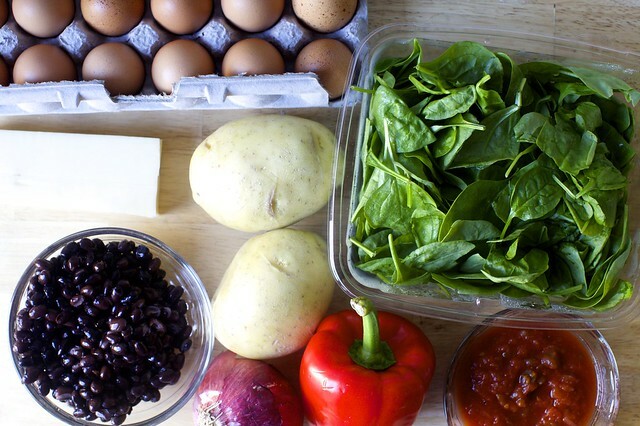 Regarding weeping eggs – and general soggy breakfast burrito sadness. The ingredients must be cool before you roll them up if you are going to reheat them. If this is of use to you, I make these and cut them in half; you don’t have to have EXACTLY a dozen eggs, a decent knob of butter is fine, the milk can be mostly just in the neighborhood of the right amount, and it all comes out fine. I use an 8″ x 8″ glass pan and hit it with nonstick spray. SUPER easy and really fluffy and GREAT in breakfast burritos! Just want to say I run to the kitchen with your recipes because they are always amazing. This was no exception. Thank you! This is a great recipe! Let me say two more things: breakfast is great for dinner. These could be smothered in a chile sauce (green or red, homemade or in a jar). Flavor variations: you might toss in some toasted crushed cumin, or some chopped garlic. Or even slivered basil. I froze a bunch of the roasted veggies (without egg or sausage) thinking they could be either burrito filling, or a lovely side dish to go next to a roast chicken, another in-a-hurry dinner. You just said the magic words. I absolutely love breakfast food and think that it’s criminally underrated. Yummy! On to my second batch already. Stocking up the larder. There look dreamy! I’m going to have a go this weekend. Would it be possible to make them without eggs do you think? You’d need a lot more of the other ingredients to get the same yield, but definitely. When you recommend heating the tortillas over a pan of residual warm water – I don’t see anywhere in the recipe calling for a pan with water. Wowzers. Just ate them for dinner. 12 yo approved of that plan: “spinach has no place in my breakfast.” The eggs were perfect. They did take forever to heat in the oven. I definitely must have over-stuffed them. Next time I’m doing the microwave-to-dry-skillet method. To my mind, the faster way of doing it would be: saute your meat if you’re having it, remove to pan into paper towel lined bowl. Saute onions and peppers in the little bit of oil left in the pan. Use a potato that is already baked (instant pot, microwave, leftover) and add to the pan. 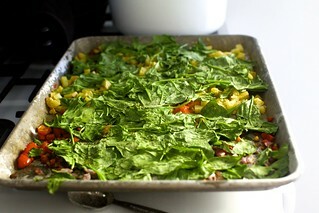 When done, push all components to the side of the pan and wilt greens next to it. Cook the eggs in a separate pan. I really think, though, that the thing that makes it time consuming (and delicious!) are all of the components. And that you’re going above and beyond to make it delicious instead of just using frozen potatoes, cooking some eggs, and calling it good. Your blog is amazing and I love your recipes! This is something I will have to try this weekend. We’re having a road trip and we’re staying at a motel in the middle of nowhere. We can freeze them at home and warm them up in the microwave we have in our room. These breakfast burritos will be an excellent quick breakfast in the car before we head back. My wife will love it! Looking for a yummy and healthy make-ahead breakfast? 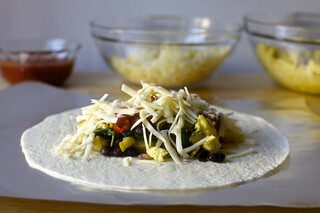 I am fond of taking these type of healthy breakfast burritos. Sounds fantastic! I’m going to make a pile of vegan & non-vegan ones (for the S.O) tomorrow for dinner & freeze the rest. The use of spinach seems ingenious: no. soggy. lettuce. Spinach is one of those things that is good in many different ways, so it should be delicious! I’ve tried to make so many breakfast burritos and never had any success. These are so good! I just made them the other day and they are going to be a staple in my house for sure. I love the veggies and how easy everything comes together. I’m so happy I made the double batch like you recommended. Thanks, Deb, for another perfect recipe! I’d let my CSA egg share stack up a bit and this was a great way to preserve the excess. I utilized a trick from Melissa d’Arabian and sliced off pseudo-lardon from a frozen pound of bacon, frying it up on the stove top and adding more flavor to my eggs by cooking them in a small amount of the rendered fat. Your toothpick tip yielded perfectly warmed burritos! These are an absolute game-changer on busy mornings! Full disclosure: I swapped in a sweet potato for one of the Yukon Golds. When I started the recipe, I could’ve sworn that I had a can of black beans kicking around, but I didn’t, so I just used a can of chickpeas. They were still delicious! I bet they’ll be even better with black beans. My kids and husband, who are, let’s say, “veggie-averse”, love them, though they have requested more sausage in the next batch. Just put all these ingredients in my grocery order. Thanks to the person who suggested Alexia Tater Tots- note, Alexia has titled them “Potato Puffs”, so if you’re searching online, go by the brand name! So excited to put these in the freezer! If I love them, I’ll make a batch or two near the end of my pregnancy. This is perfect new baby in the house food. Delicious! For others with limited freezer space: I went ahead and roasted all the “innards” and froze them flat in a freezer bag; ready for future me to mix with eggs and put into tortillas! A vendor at a farmer’s market we go to used to have breakfast burritos that seemed very much like these. They were absolutely wonderful. She heated them by placing them in a George Foreman grill type thing (still in their foil wrappers). It flattened them out a little but they were big and were probably easier to eat flattened slightly. The vendor is no longer there and I’ve been missing her burritos. This is perfect. TOPO CHICO yessss! It’s so real. These look good! I make batches of burritos for my busy college students, it’s so easy for them to heat one in a microwave before they run out their doors, and they fill up your tum post-bar-crawl, I’ve heard! You need to try this twist, and I’m begging you – this is not really hot like it sounds – is to put a line of sriracha and a line of honey down the length of the filling on the tortilla. (This is a trick I learned on epicurious with a breakfast sandwich and it is SO GOOD.) Plus, you don’t need to pry it open after heating and put salsa in, and it doesn’t make it wet or drippy. My girl likes hers with a whole wheat tortilla, turkey sausage, soft eggs, roasted sweet potato, onion, and cheese, and I make hers on a smaller-size tortilla to make the carb count smaller. And of course, the magical sriracha and honey which completely MAKES IT. Oh my gosh. I made these on Sunday afternoon and now I’ve eaten a breakfast burrito for the past 2 days. My pregnant self has never, ever, EVER been happier. I’m going to make a double batch before the baby comes!! To add additional flavor, and make them a million times easier to fold up. Take the tortilla and place it direction on your burner with the heat on low. Flip it after about 30 seconds (it’s hot, so don’t burn yourself, tongs are helpful). And char it a bit on the other side. That’s how my husbands grandmother (directly from Mexico) does them and they are SO tasty!! And I noticed someone else mentioned soyrizo. It’s awesome! Tastes just like the real thing….BUT NO GREASE!! I love it in things like this. Deb to the rescue again! We have now made these twice and they are unbelievably delicious. Using smaller soft taco size burritos, we are now the proud owners of 24 mini burritos, all wrapped and waiting for a Saturday morning where we don’t want to cook. The second time around we added some leftover grilled ribeye steak and corn and used all of our CSA tomatoes on fresh salsa. So very good. My future self is already excited to have them again! Geez, that looks amazing. I love burritos but this recipe looks particularly nice. I think I may give it a try this coming weekend! Your breakfast looks very delicious, and my mouth full feel with the water to see your post. I made a double batch of these and loved them!! My bacon didn’t get crispy in the oven for the baking time and I overcooked my eggs by accident, but otherwise, I love these. I recently transitioned from being a stay at home mom to working as a tutor 30 hours a week in a high school and have to be at work at 7:15, so these burritos fuel my day!! I find them great for breakfast, lunch or dinner. If you have leftover and you want to reheat I have a great article written by Jennifer Kessler (https://shelovesbest.com/best-way-to-reheat-biscuits/). This method works great on burritos. Looooong time fan, first time commenter. We made these this evening (yay breakfast for dinner!) and I think they’ve changed my life. I am thrilled to have some in the freezer – a real gift to our future selves. We used vegetarian chorizo in place of sausage/bacon, but otherwise ingredients were almost to the letter. It’s hard to get large tortillas here in the UK, so they came up a little small. Size is also an issue for the oven/baking tray arrangements we have (boo London flats), so I used more pans than I’d have liked, but I have zero regrets. Thank you Deb, for this and for all the other times I should have commented but didn’t. These were delicious. I made mine with Uncanny Refried Beans, Alexeggs with cheddar mixed in, baby spinach, Uncanny Refried Beans, and Alexia hash browns. The beans and hash browns had flavor, and some spice, so I didn’t use salsa. Next time I will increase the eggs and decrease the beans and hash browns a little bit. I will also probably wilt the spinach before adding it because the bulk of the raw leaves made it a little harder to roll. I’m sure I’ll microwave one at some point, but they are SO GOOD coming out of the oven. Thank you! I just made breakfast burritos a few days ago – they are a bit of a hassle, but I love them so much I just deal with it (and I usually make them for dinner). I haven’t figured out reheating them in the microwave, so I generally don’t freeze them, but I’m definitely going to try the sheet pan method. Just finished shoving another burrito down my gullet. I’ve been anti breakfast burrito for many moons because I don’t care for salsa on my eggs. I made these on a two week meal planning whim and they have been a lifesaver! Dinner after a day of meal prep? Breakfast burrito. Lunch after a four hour car ride back from a weekend in Maine? Breakfast burrito. Breakfast at my desk because I drank too much French press coffee and I’m feeling a little queasy? You guessed it. I’ve got two more to tide me over until the next meal prep day and I can’t wait to make them again! Ah yes, great ideas here… my daughter is on a burrito quest at the moment and I have been making them a fair bit but terribly plainly. So many thanks from over in Australia, where our breakfast burritos will be eaten at the time your afternoon ones are. So glad to read they can be frozen. Next plan is for my wee lass herself to read this post and start to cook them herself. She is 12, so I think she could start to try these. Do you reckon 12 is an ok age to cook these? I might shadow or help the first time? Yum! I am going to make these for dinner tonight! These were amazing! The only change I needed was that I found two sheet pans necessary for the roasting to get everything sufficiently spread out. I used a soft breakfast chicken sausage, and just cut it into pieces with scissors without removing the casing. This made a great brunch meal for friends! I made these last night and they were divine. I made them with a local bacon instead of sausage (per the options) and without peppers (hot and sweet) and shallots instead of onions. I added smoked paprika to the potatoes and beans since I don’t have any tolerance for spicy food. I put avocado and yoghurt on the immediately eaten one, but not the frozen. I figure I can make some sort of dip for them when I pull them out that I dollop on before each bite. The dozen ones are going to be a godsend in the next six weeks while I get through the rest of the term. These came out so good! I mixed and matched what I put in, but having these in the freezer made me so much happier about life, I can’t even tell you. I’m going to make another round tomorrow, mixing it up again so we don’t get bored. Thank you! This is the best food for someone who is currently on a diet. Thrilled to try and make one of these soon! One question, can I use other salt aside from Kosher? Thank you so much for sharing this recipe, Deb! Made a huge batch of these for my friend to serve to her family, all the groomsmen and other guests who were staying in her house on the morning of her son’s wedding. Wrapped and froze them early in the week so all they had to do was heat them on that hectic morning. Except for the bride who said they were soggy, all the other young people kept seeking me out to say thank you and say how delicious they were. Took some liberties with the recipe since the nearest store was over a half hour away and any ingredient I forgot at home was replaced with something in the pantry or fridge. Made some vegetarian which were a big hit. Having recently discovered that eating eggs at breakfast really does fill me up for hours, I am now so over scrambled eggs and omelettes that I am ready for something else. I don’t have time to do a mega prep and cook every day so your tips on freezing stuff are just the encouragement I needed. I love finding recipes to make ahead and freeze! We are a burrito loving family, so this is perfect! Thank you! I love the “chop up extra while you’re at it” tip. Totally applying it to the rest of my life. You’d think it’s common sense, but you’d be surprised how much time I’ve wasted prepping veggies and washing dishes in small portions over the past year. My future self is thanking you! On a side note, as an absolutely rookie chef with no oven (just a stove) – how do you think this would turn out if I just grilled everything in a frying pan? I used to make batches of breakfast burritos all the time, I def need some inspo for new ones. Love the idea of the spinach! Hi Deb, been reading your blog for years but compelled to comment now.We’ve just had these for dinner (with 6 more safely tucked away in the freezer) and they were AMAZING. I’m due to have my first baby in two days (eep!) and have been cooking my way through your freezer friendly section all week in preparation – with so much on the other side unknown there is something so reassuring about having granola bars and dinners for days safely squirrelled away. So a massive massive thank you! Wow, Deb, these were great! Threw a bunch of stuff I had on hand in as well. Fed a starving crowd of 7 and froze 8 more. Can’t wait to eat them again! Count me as one of your biggest fans! Thanks for all the great recipes, and love your personal take on all things! Just found this recipe and I love how you break it down on if we want to freeze them and giving the explanation. Can’t wait to try them! This recipe will likely save me lots of $$ since I’ll be staying home to cook it rather than heading to the local breakfast spot. Thanks! Wow! These breakfast burritos are so delicious and we’re so easy to make! I opted out of the meat (vegetarian) and dairy (lactose intolerant) and they were still unbelievably flavorful! Thanks for created such a great recipe!